After a long winter, nothing creates more excitement than warm weather and the chance to enjoy summertime on the water, especially somewhere like Lake Michigan. 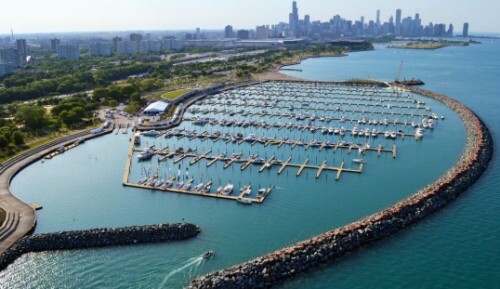 The Progressive Insurance Chicago In-Water Boat Show is the ideal event to dive into summer with hundreds of boats to browse and buy at 31st Street Harbor, Chicago’s newest state-of-the-art marina. The in-water boat show, in its second year, has fast become a staple to Chicago’s busy summer event lineup, offering Chicagoans food, fun and a chance to get on the water. The show will feature more than 150 power and sailboats for sale, dozens of vendors showcasing thelatest and greatest in marine accessories and gear and attractions for all ages on land and water, including free paddlesports on Lake Michigan and on-water boater education for all levels of experience. For more information visit ChicagoInWaterBoatShow.com. Also happening this weekend is the Channel Islands Harbor MarinaFest. You can't go wrong with free admission to an event like this in beautiful sunny Southern California. The event includes new and used boats on display, as well as product and food vendors and great island music. More info at www.cih-marinafest.com. Next up is the Bay Harbor In-Water Boat Show at Bay Harbor Lake Marina in Bay Harbor, Michigan. The show, which is today through Sunday (Father's Day), features displays ranging from personal water crafts to luxury yachts. For more information on these and other upcoming boat shows and festivals, visit the FirstBoat boat show calendar. Kids, ladies, friends... if you a few extra hours to spare this weekend, and you're near one of these events, why not take Dad to a boat show. Let him mill around, check out the big boats, shop, or just walk the docks. And go with him. Enjoy his company. You won't regret it. One last thing... If you still haven't bought a gift for Father's Day, you still have time... it's not until SUNDAY, June 16th (That's THIS SUNDAY!) Consider getting dad some personalized gear with his boat name engraved or embroidered on it. He may not be the type to normally buy these sorts of things for himself, but surely he'd love to have a t-shirt, hat or a nice weather resistant jacket with his boat name embroidered on it. 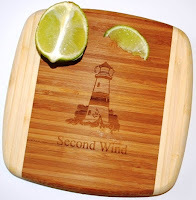 Or perhaps a brass bell, a bottle opener or cutting board with his boat name engraved in it. It's not too late to get him any or all of these things if you give him a gift certificate to our sponsor, BoatNameGear.com. You can order a gift certificate online, and have it emailed to yourself to print out and give him, or you can have it emailed directly to him. They are emailed immediately when you purchase them online at BoatNameGear.com.